Girl Scout Binder Set...Don't Forget the Giveaway! - The Resourceful Room! 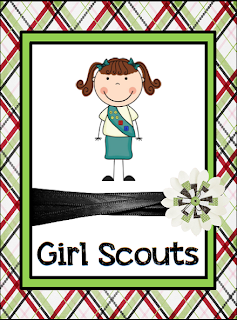 Girl Scout Binder Set...Don't Forget the Giveaway! So I finally finished up the Girl Scout Binder/Calendar set!! Here it is for all you Troop leaders, I would appreciate feedback since I am not a leader and did the best I could with the suggestions I got! and don't forget, I've got an awesome giveaway for some cool Carson Dellosa products going on! Check them out HERE!! You could have your own set! Get the UPDATE for 2013-2014 and an EDITABLE Version you can Customize HERE! Amy. The binder set is fabulous! I wish I was involved with Girl Scouts so I could have a use for it. Absolutely love the color scheme and labels that you did. Your work is awesome as always! I am a troop leader, this is great. Its so cheerful. Can't wait to print them out and put them in my binder. Thanks so much for doing this. Great job!!! I am a troop leader and this ROCKS!!!! Thank you so much!!! I absolutely love this thank you so much for sharing ! I absolutely love this thank you so much for sharing! Troop 6080 in Conway, Arkansas! I'm a troop leader also, and this is so cute! Thanks for sharing! This Girl Scout Binder set is fantabulous! I can't believe this is free. Thank you so much for sharing! Fantastic job on the Girl Scout Binder set. We just started our troop and this will really help us keep organized. Thank you, Thank you, Thank you!!! Love, Love, Love it! Thanks for creating this Girl Scout Binder set. It's fabulous! This is FABULOUS! I am a troop leader and the Service Unit Manager for our area. I think I'll print this for all my leaders as a nice little thank you gift. Could we get this in an editable format so that we can update it for next year? I am an new leader and this would be fantastic! I love this!! Can we get an editable version or an updated calendar for this year? I used this binder last year and it was awesome! I hope there's a 2013-2014 version! Wink Wink! Very cute! I have a troop that does money earning projects so a page for the topic would be great! Love It - Cant wait to use it. Hopefully you will do an updated calendar for 2013-2014. Are you working on an editable version of the Girl Scout binder? Would love to use it this year!! So cute!! Found and purchased the editable version -- so excited!! Will you be doing an update for 2013-2014 for the free version? I found the editable version udated in the store, but following the links for the updates does not include the girl scouts set. Thank you so much, I love these! I am a former teacher and a brownie leader...when it came time to print my binder this year I searched high and low for your calendar again and this morning finally found it again! I will be purchasing the editable version. I love the graphics and applaud all of your hard work :) have a wonderful school year!